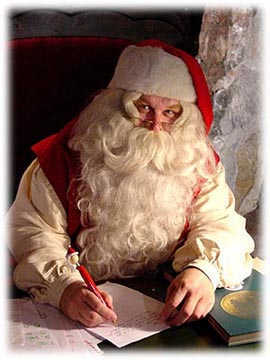 Christmas and Joulupukki (Santa Claus) - as my Finish friends call him, - will be knocking on the door soon. So it is time to start preparing ourselves for this nice holiday. During this time everybody is thinking heavily about Christmas gifts. I think we can easily agree that this is a big job to find the right one to give to our loved ones. I was also thinking about what kind of present I could give to my kind and highly respected readers. Finally I got the idea; maybe some of you would like to surprise your families with a special Christmas menu. So, I have an idea: Why don't you try to make traditional Hungarian Christmas food? It is a good idea, isn't it? So, my Christmas present to you is my family's secret Hungarian Christmas recipes. This is a full Christmas menu for Christmas Eve coming directly from my Grandmother. I hope she won't give me a slap because I blurt out her secret Hungarian Christmas recipes :). But, she is so nice that I'm sure she will forgive me this impishness. 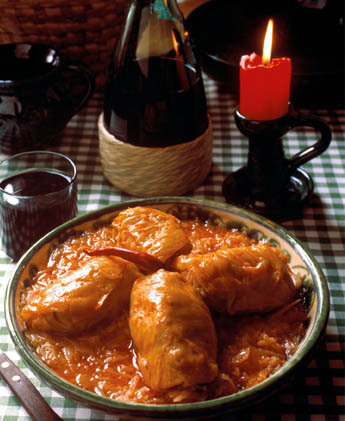 In Hungary we eat Fish soup, Stuffed cabbage and Bejgli, (Poppy-seed or Walnut roll) on Christmas Eve. In some families, like ours, we also eat fish fried in breadcrumbs. OK, I think it's time to start with the promised Christmas recipes! Just try Hungarian fish soup once and you will never forget it! I guarantee! I have to tell you the truth: this is the most challenging part of these Hungarian Christmas recipes. I would say it is not very difficult to cook Fish soup, but it requires lots of patience and time. There are many variants of the Hungarian Fish soup. 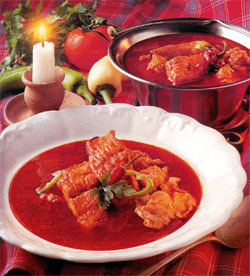 The two main trends are the Bajai Fish Soup and Szegedi Fish Soup. As you probably know there are two big rivers flow across Hungary, these are the Danube (Duna) and Tisza. Both river regions have its own style of making Fish soup. The main difference between these two fish soups is that we put noodles into the soup if we cook in Bajai style. That's all. Of course next to these two main trends every family has its own style of cooking this superb soup; therefore I'm sure that lots of people could have totally different ideas about fish soup cooking than mine. Let's celebrate Christmas together! Click here to see how! So, are you ready to become acquainted with one of my family's secret recipes? I'll share with you the way we cook the world famous fish soup in my family. What do you need for this gorgeous soup? Of course FISH! But it is very important to choose the right fish! It cannot be sea fish. The original Hungarian Fish Soup is made mainly from carp; of course you can use other types of fish other than carp too: catfish, starlet and bass are all good choices. If you want to make an unforgettably good fish soup, use several types of fish. Buy 250-300g fish per person. If you have just one type of fish I recommend buying smaller ones too. Clean and wash the fishes, open them and remove the chitterlings. Remove the heads, fins and tails. etc) in finger width pieces and salt these slices. Clean and chop the onion and fry it in some lard as you do e.g. when you cook Hungarian goulash. When the onion is transparent put the small fishes, the fins, the tails and the heads (without eyes and gills) into the pan with the onion, and sprinkle with ground paprika. Fill up immediately with enough water to cover (e.g.3Liter) and cook for 30-40 minutes. The cooking time could be longer, it is ready when the fish meat comes off from the bones. This will serve as broth for the salted fish fillets. Be careful with the paprika, if you burn it the fish soup will be bitter! After these small fishes are cooked, mash the whole broth and fish mixture through a colander. You can add more water if it's too thick. Put the salted fish slices, the cleaned and diced tomato and sliced green pepper into the broth and bring it to the boil. Taste it and if needed add a little more salt. Cook the Fish soup for 10 minutes. Don't stir the soup because the fish meat will be broken. If you're afraid the soup might stick and burn, just move the pot a little. If you want you can cook some noodles for the Fish soup and then you will get the Baja style soup. It really depends on your taste, and what you prefer. The most critical ingredient of the Stuffed cabbage is the sour cabbage. Its success largely depends on not only the preparation methods, but also on the quality of the ingredients you use. The guarantee of success lies in the tasty cabbage, the smoked products and the pork you use. Add the semi-steamed rice to the mince, then mix with the browned onion and fried bacon, the egg, the herbs and mix thoroughly. Remove the veins from the cabbage leaves, then spread the fillings on them fold the edges and roll up. Put half of the sauerkraut on the bottom of a pan, than place the stuffed cabbage on the top, continue with the smoked ribs and top with the remaining cabbage and simmer with the lid on. Then, remove the pork and the stuffed cabbage, reduce the juices with the cr?me fraiche liaison and bring to the boil. Serve by putting the sauerkraut in a deep dish, then topping it with the stuffed ones and drizzling with cr?me fraiche. Finish with the chopped, smoked rib. (Christmas rolls, or as others call it, Poppy-seed or Walnut rolls)? 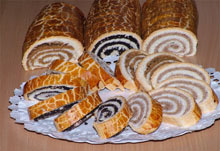 This delicacy originates in Bratislava, from where the holiday dessert arrived in Hungary. On a flat surface mix the flour with the salt, the butter and the sugar using your hands. Mix the yeast with some lukewarm water, then add to the flour mixture and knead the whole lot with the eggs. Cover, and leave to rest. Then, roll the pastry out to a rectangular shape and spread the cold poppy-seed or walnut filling on top. Roll up and tuck in the ends, then lay your rolls on a baking tray, keeping an appropriate distance between the two. Prick the top with a fork couple of times, then brush with a whole beaten egg and let it dry. Bake in a hot oven. The rolls should look like nice and pretty. I recommend checking your rolls regularly. It is ready when it has nice gold brown color. Make a syrup from 200ml water and the sugar. Pour the ground walnuts in the mixture, then add the raisins, the lemon zest and the breadcrumbs. Simmer the whole lot and let it cool. Add the sugar and the vanilla sugar and the ground poppy seeds. Simmer, then season with a pinch of ground cinnamon. We also like to bake another type of Bejgli. We use raised dough for this type of Christmas roll. Making it takes a little bit more time than the traditional Bejgli, but it is worth it to try it out. I like this version much better. Put the yeast and one tablespoon sugar into a small amount of warm milk and wait until the yeast comes up. Mix the rest of the sugar, the salt and the two yolks with the warm milk. If you like you can add a little dark rum. Make dough from the flour, the prepared yeast and the mixed milk. When the dough is almost ready add the melted butter (it shouldn't be hot) and knead the whole lot until it is even and clean-boled. Sprinkle the top of the dough with flour, cover and leave to rest in a not too warm place. When the dough has doubled itself divide it in two on a floured bake board. Then roll the pastry out to a rectangular shape (it is done when the dough is finger width) and spread the poppy-seed or walnut filling on top. Roll up, and then lay your rolls in a baking tray, keeping an appropriate distance between the two. Brush the top with a beaten egg yolk. You can make the Christmas roll so that you fill one roll with walnut and the other with poppy-seed, but in this case use just half of the indicated amount of the filling ingredients. Bring the milk to a boil and put the walnuts and the sugar into it and mix well. 3. Take the whole mixture from the stove; add the washed raisins and lemon zest. If the filling is too dense you can add more milk. Let it cool before you fill the Bejgli. Simmer and add the honey and apricot jam. Boil the whole lot a bit and take it from the stove and let it cool. The filling has to be easily spreadable! Good luck and I wish you Merry Christmas! I hope after reading this appetizing Christmas menu, some of you will surprise your family with these superb Hungarian food using my Grandmother's secret Hungarian Christmas Recipes. Let's celebrate with a Christmas dinner together! Of course this page is about Hungarian Christmas recipes, but I'm sure you have totally different traditions in your country and your Christmas dinner also differs from the Hungarian. Therefore I thought it would be great if you could share the recipes of your Christmas menu and write couple of words about your national Christmas traditions. What you should do is very easy. Just fill in the forms below and by doing this you are building your own webpage in my site; moreover you can also upload your pictures. So if you have a great recipe, story or funny picture which is related to Christmas dinner preparation, don't hesitate to take this opportunity and share it with others. I know what you are thinking right now. "Well, this is great, I have lot of things what I could share, but I'm not a writer and I don't know how to make a web page." Forget this; you don't need to be a writer! What are you doing when you write an email to your friend? You just simply share your thoughts via your keyboard. So, do the same here and that's all! And you don't even need to know anything about web page building. What you have to do is the same what I told you above: write down what is in your mind and the system does the rest. And you will have your own page on the web, which can be seen by others around the world. Have A Great Story About Your Christmas preparation? Do you have a great recipe, story or funny pictures about your Christmas dinner preparation? Share it with others! Do you have a picture to add? Great! Click the button and find it on your computer. Then select it. Important Note: The maximum image width accepted is 450 px. You may want to resize any photo larger than the accpeted pixels use your graphics software or a Web-based resizer, such as Picnik.